Гундогар :: Turkmenistan's Leader — Protector Or Loner? 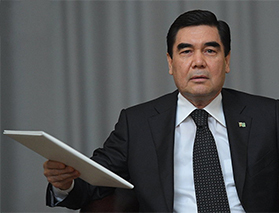 Turkmenistan's Leader — Protector Or Loner? Since May 2017, Gurbanguly Berdymukhammedov has had several opportunities to attend major international events but did not go. In fact, Berdymukhammedov has not seemed to stray far from home lately. It seems that Turkmen President Gurbanguly Berdymukhammedov, known in Turkmenistan as «Arkadag» (The Protector), does not much like to socialize. Maybe he should be called «Garasoymez» (The Loner). Since May 2017, he has had several opportunities to attend major international events but did not go. In fact, Berdymukhammedov has not seemed to stray far from home lately. On June 14, Berdymukhammedov chose not to attend (or maybe was not invited) to the opening of the World Cup in Moscow, although the other four Central Asian presidents were all there. Berdymukhammedov is a sports enthusiast, at least according to footage and photos released by Turkmen authorities. Admittedly, he does not seem to be much for team sports, preferring bicycling, weightlifting, or shooting baskets while riding a bicycle; so maybe soccer doesn't appeal to him. Stranger was Berdymukhammedov's absence at the June 12 ceremony in the central Turkish city of Eskisehir to launch the Trans-Anatolian Natural Gas Pipeline (TANAP). Turkmenistan is a gas-exporting country, or at least it wants to be. (Turkmenistan currently exports gas only to China.) For years, Ashgabat has expressed a strong desire to sell some of its vast amounts of gas to Europe. The problem has always been lack of an export route — a pipeline like TANAP. Initially, TANAP will carry some 16 billion cubic meters (bcm) of gas annually, and plans call for the pipeline to be expanded to accommodate 31 bcm by 2026 and eventually to 60 bcm. Azerbaijani gas production is rising, but that country is also expanding domestic gas use. Alone, Azerbaijan cannot meet the pipeline's capacity after future expansions, and Turkmen gas has frequently been mentioned as an additional source. That would still require construction of the Trans-Caspian Pipeline (TCP) to bring Turkmen gas across the Caspian Sea to Azerbaijan, but Berdymukhammedov has spoken confidently of that project's realization. Turkish President Recep Tayyip Erdogan telephoned Berdymukhammedov on June 2 to invite his Turkmen counterpart to join in the TANAP launch ceremony, but Berdymukhammedov wasn't there on June 12. If nothing else, it would have given Berdymukhammedov the opportunity to talk with Azerbaijani President Ilham Aliyev, who did attend. Russia is signaling that a long-awaited agreement between the five littoral states (Russia, Azerbaijan, Turkmenistan, Kazakhstan, and Iran) on the legal status of the Caspian Sea is at hand and should be signed this autumn. The TANAP launch would seem to have been a propitious opportunity for Berdymukhammedov to discuss the future with Aliyev. Of course, maybe Berdymukhammedov's absence at the TANAP launch is an indication he has concerns about the possibility of building the TCP. Berdymukhammedov missed the Central Asian summit in Astana on March 15. Instead he went to Kuwait and the United Arab Emirates in search of investment in Turkmen gas-export projects. That trip was the farthest Berdymukhammedov has traveled since he suddenly decided to head a Turkmen business delegation to Germany in September 2016. He was not in Saudi Arabia at the summit of Muslim countries attended by U.S. President Donald Trump in May 2017, although the presidents of Kazakhstan, Tajikistan, and Uzbekistan went. Berdymukhammedov had by then already missed the One Belt One Road (OBOR) forum in Beijing on May 15, even though the transglobal trade network envisioned in OBOR includes Turkmenistan and a railway and port facility have been built there as part of the network. The presidents of Kazakhstan, Kyrgyzstan, and Uzbekistan attended that forum. Berdymukhammedov has not been a total homebody, and he is scheduled to travel to Dushanbe for an international forum on water resources before the end of June. And aside from the trips to Kuwait and the U.A.E., Berdymukhammedov also visited Uzbekistan on April 23-24; he was in Herat, Afghanistan, for a few hours on February 23 for the launch of construction of the Turkmenistan-Afghanistan-Pakistan-India gas pipeline; and he was in Sochi in October 2017 for a CIS summit. He was also in Astana in June 2017 for the opening of EXPO-2017 there; but that was something of a quid pro quo visit, since Berdymukhammedov had invited the Kazakh president, and the other Central Asian presidents, to attend the opening ceremony of the Asian Indoor and Martial Arts Games that Turkmenistan hosted in September 2017. Turkmenistan has long been seen as an isolationist country, and the leader sets the tone; but Turkmenistan could surely use some outside help at the moment, as the country's economic crisis continues to grow worse and the situation along its border with Afghanistan is uncertain. But with no solution in sight, particularly to Turkmenistan's economic woes, Berdymukhammedov is choosing to remain aloof from contacts with leaders of countries that will necessarily play key roles in determining Turkmenistan's future as a gas exporter and transit hub. But the economic crisis Turkmenistan now faces is arguably due to in part to his decisions to spend billions of dollars on projects like white-marble, four-star hotels, a beach resort in a country that doesn't allow many foreigners to visit, sports complexes for those games that Turkmenistan hosted in September, and a golf course in a country where almost no one knows how to play the game, to name just a few of the white elephants dotting Turkmenistan's landscape. Turkmenistan has been called the hermit kingdom; but it might not augur well for the country to have a hermit leader in its time of need.